North Stradbroke, affectionately known as “Straddie” by most South-east Queenslanders, is the world’s second largest sand island. It’s a popular holiday destination on Brisbane’s doorstep, with beautiful surfing beaches and a laid-back feel. Amendments to the 2011 North Stradbroke Island Protection and Sustainability Act, passed by the Queensland parliament last November, are intended to allow, in 2019, mineral sand mining on Stradbroke, by the Belgian owned concern Sibelco, to be extended at the main Enterprise mine, to 2035 from its current limit of 2019. Sibelco stands to benefit by $1.5 billion, according to its own figures. Last year, it announced the closure of the ‘Vance’ silica sand mine on the island which had employed 13 people. It had not been scheduled to close until 2025. Its entire future operations depend upon the Enterprise mine. One overreach Fitzgerald mentioned was the “reduced protection of the environment and support for commercial activities posing a risk of major damage to natural assets, including the Great Barrier Reef and Stradbroke Island”. Fitzgerald’s comments should place a sharper focus on Campbell Newman’s relationship with Sibelco and what Queensland Labor MP Jackie Trad has called the “cash for legislation deal”. In 2011 the former Labor government passed special legislation extending key expired mining leases at the Enterprise mine to 2019, extinguishing the legal rights of objectors under existing legislation. But Sibelco wasn’t satisfied. It had wanted an extension to 2027. It then campaigned against Labor in the lead up to the 2012 state election. It claimed that it had a legal right to have the expired mining leases extended to 2027 – a claim which did not stand up to scrutiny, as renewal of the leases was by no means certain. The miners spent millions on the campaign which included full page newspaper and 108 prime time television advertisements. It also involved a $91,840 letter drop campaign for Campbell Newman in his Ashgrove electorate. This issue has been referred by Trad to Queensland’s recently renamed but discredited Crime and Corruption Commission. The Newman government’s legislative favour also occurred even though Sibelco was in the middle of a criminal trial on charges relating to the unlawful removal and sale, over many years, of large quantities of non-mineral sand. The prosecution, one of the longest-running in Queensland’s history, resumed on 22 August despite Sibelco’s unsuccessful applications to have the charges dismissed. Last year, it was ordered to pay $255,000 in costs for failed applications. The Magistrate has reserved his verdicts on the charges and will deliver his decision on a date to be decided. Since last November, the Newman government has misinformed the media and the public, about its amendments to the Stradbroke legislation, claiming sand mining had already been extended to 2035. The truth is that no extension of sand mining to 2035 (or 2027, the date sought by Sibelco in 2012) is scheduled to occur until 2019 – the current expiry date of the relevant mining leases. If a future parliament repeals the Newman amendments, mining will end at the main mine in 2019. Even the Newman government may be forced to repeal its amendments. The island’s native title owners, the Quandamooka people, in June launched a High Court challenge against the Queensland Government. They are seeking a declaration that the Newman amendments in favour of Sibelco are invalid under the Australian constitution due to a conflict with a 2011 federal court native title determination and an associated Indigenous land use agreement with the State government. If the Newman amendments are repealed, no compensation is payable to Sibelco because Section 6 of the North Stradbroke Island Protection and Sustainability Act specifically rules it out. This would not be an unreasonable result in the circumstances. When Sibelco purchased the Enterprise mine in 2009 it was aware that an application to renew the key mining lease, which expired in 2007, had not been decided. It also knew that there was significant opposition to renewal from environment groups and indigenous owners who had already made their intentions to challenge future mining plans clear to the former mine owner. 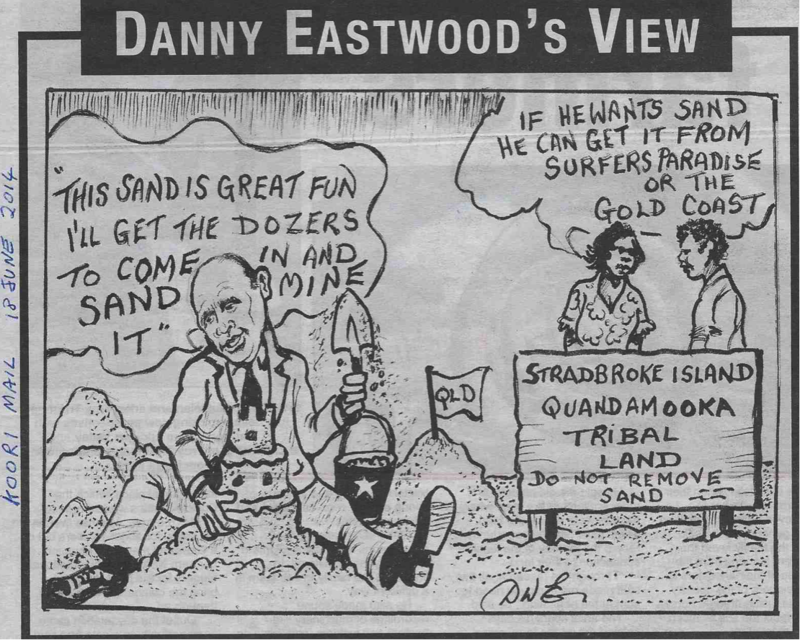 It is well known that sand mining causes “major, permanent and irreversible environmental harm.” This was the conclusion of the the Fraser Island Inquiry in 1976. Campbell Newman’s father Kevin was the Federal Environment Minister. He accepted the findings and ended mining on Fraser Island, the world’s largest sand island, within weeks of receiving the Inquiry Report. The Federal government rejected the the Bjelkie-Petersen government’s request for a two year transition. North Stradbroke’s future depends upon its natural environment being protected as far as possible. Enough damage has been caused by sand mining. The recent Stafford by-election swing of over 18% against the Queensland Liberal National Party government sent a clear message that the public has had enough of the Newman government’s extreme decisions. His amendments should be repealed and there needs to be a truly independent public inquiry into the “cash for legislation” deal.